"If I had followed my better judgment always, my life would have been a very dull one." 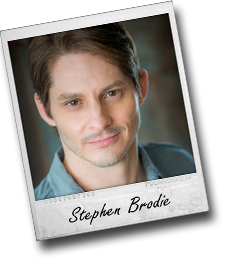 Stephen Brodie was born and raised in Dallas, Texas, and is the oldest of three children, including brother James and sister Brandi. He is very fortunate to have a family that has always supported him in anything he's wanted to do, and he has a beautiful daughter, Autumn, for whom he tries to be a good example. Growing up, he was an avid reader, and from an early age, he began to write short stories and poetry. He has published nearly 40 poems, both in print and online. One of his poems was published by MADD (Mothers Against Drunk Driving), becoming the first ever to be published in its survivor newsletter. He also once won a $10 prize when one of his poems was chosen as "poem of the month" in a small poetry review. It was published opposite the "recipe of the month" and is one of the highest honors his poetry ever earned him. It's hard to top that. At the age of 19, he founded Illya's Honey, the quarterly literary journal that he both edited and published for nearly 4 years, accepting submissions of poetry, microfiction, and black and white artwork from around the world. Unfortunately, due to time constraints caused by the acquisition of a "real job," he was forced to turn full control of Illya's Honey over to the Dallas Poet's Community, where it is alive and well today. Ever since he was a young boy, it was thoroughly evident to anyone who met Stephen that he was destined for the stage and screen. He was a natural born entertainer, comfortable in the spotlight, and thrived on attention. He went on to win lead roles in community theater productions and throughout his high school career before getting his "big break" and being catapulted to stardom. Wait. No, that's not right. Stephen was always creatively and artistically-inclined, and although he dreamt of acting, singing, and performing his poetry live, he was, alas, far too shy to act on those desires. Well, that and he couldn't sing very well. Instead, he avoided situations where he might somehow become the center of attention. In school, he consistently took zeros on work and projects that required him to stand up or present in front of the class. Despite these shortcomings, however, he worked very well with others and was always the teacher's pet. After school, he began a career in corporate America, working in technical support, network administration, and web application development. The paychecks were nice, as were the bonuses, profit-sharing, and the 401(k). He was continuously promoted from one team to another, often closely preceding the layoff of said previous team. And no, that was not his fault. Still, even being in demand was not enough to boost his confidence to a sufficient level. He would still find a way out of making presentations and speaking at meetings, learning along the way that if you fall asleep in enough meetings, management will eventually quit inviting you to them. Life was pretty good. There were a few women in Stephen's life. Okay, many. After a string of failed relationships, and some soul-searching, he set his mind on getting to the bottom of his insecurity and fears of commitment. He sought help from a professional, but that only helped empty his bank account. Then it hit him. Even though he had a good life, by most standards, it wasn't the life he wanted. He was standing in his own way. So, he decided to seek more therapy, but this time, in the form of an acting class. What better way to address your fears than to get up and perform in front of a room full of strangers. It worked. He began to take chances and worry less about looking foolish or feeling stupid, and as he hypothesized, this had a tremendous effect on all aspects of his life. Soon after, he quit his corporate job and jumped into acting with both feet. He soon acquired a couple of agents and began building a respectable resume of films, television, commercials, and the like. He has also returned to his writing roots, focusing on writing screenplays with strong, interesting roles that appeal to him and allow him to stretch as an actor. "I'll sleep when I'm dead," he says, as he nods off in front of his keyboard. Copyright © 2012-2019 Stephen Brodie. All rights reserved. Web Design by PerfectoMEDIA.